We begin the year 2019 with a panoramic view of the Book of Revelation. I owe much of my love for Christ to the Book of Revelation. My first encounter was during my bachelor studies in theology at the university. Hence, I fell in love with the book having known how Christ conquered all the enemies of the Gospel including Satan. The Book is not only the revelation of Jesus Christ, but it gives us a prophetic view of the great controversy between God and Satan, and how God through Jesus Christ restores hope in God’s children. Of course, there are frightening scenes in the book such as rebukes, persecution, cataclysms, fire, and brimstone. All these together are God’s will for our lives in the book. Sinners may find the book troubling. But those who love Christ will see glory and blessing throughout. Recently, elder Jon Paulien made an interesting remark on Facebook about how a lot of people are excited about the studies on Revelation for this quarter’s Sabbath School. He pointed out two of his colleagues, Werner E. Lange, a retired book-editor of the German Adventist Publishing House, and Ed Dickerson. Lange has launched project Revelation Do-It-Yourself “Revelation DIY.” The purpose, as he stated, is “to show church members the approach whereby they can themselves discover the meaning of the visions in the Revelation and judge whether a given interpretation does justice to the text and its context (really hears what the text says) and whether or not it heeds all principles of interpretation.” Dickerson will present short videos on Revelation to throw more light on how people can discover the key to unlock some of the difficult passages in the Book. The links will redirect you to pages. Why are people so interested (I’m no exception) in the Quarter’s lessons? In both Mathew and Luke, Jesus uses the proverb, “Where there is a dead body, there the vultures will gather” (Matt 24:28; Lk 17:37). He simply meant to say that some things can be obvious as in a group of vultures gathering around a dead body. People from certain parts of the world can easily have a sense of the meaning of the proverb. I used this proverb to illustrate how the majority of Seventh-day Adventists identify themselves with the Book of Revelation. Themes like, the Lord’s day (Rev 1: 10), Laodicea church (Rev 3: 14-22), the sweet-bitter book in John’s stomach (Rev 10: 8-11), the remnant and the saints as commandment-keeping people (Rev 12: 17; 14: 12), the testimony of Jesus (19: 10), etc. are preponderant in Adventists’ identification with the Book. Isn’t it evident that many Adventists will be interested in the quarterly? 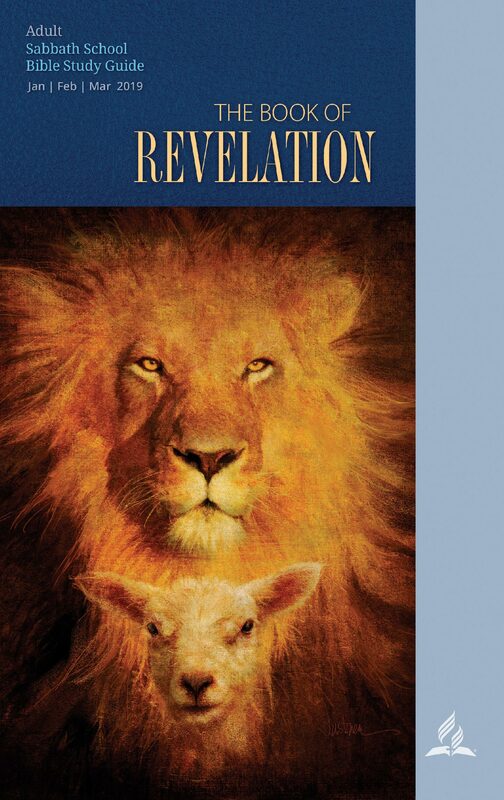 Besides, a focus on the Book of Revelation is quite rare in the Sabbath School Lessons. It’s been three decades now since the last quarterly on the Book of Revelation was studied in 1989. Majority of our church members learned about the book from seminars, books, and independent ministries. The results have yielded to several approaches and private interpretations. That brings me to the last reason why some other groups have taken a keen interest in the quarterly. The last interest group to talk about is from the theological enterprise. Many theologians, including myself, are taking turns to parade for a better approach and reading of the Book. The “Revelation DIY” by Lange, is a direct response to some of the hermeneutical setbacks often used in approaching the Book of Revelation. As stated earlier, his main concern is to provide a better perspective and approach in studying the Book of Revelation. Lange believes the Book can be understood by everyone if the right methods are provided. He also makes reference to an article in Adventist Today, about the heavy changes in the quarterly. He writes, “the text of the Sabbath School Bible Study Guide (Standard Edition) has been heavily revised in many places at the last minute before its publication.” Elder Paulien confirms some of these changes on his blog, and how some of his contributions to the Study were even dropped. Although he seems to agree that “sometimes after a manuscript is approved, even “higher” authorities may assert themselves into the text, and that temptation is especially strong with a subject like the Book of Revelation,” he also feels a clarification of those portions are necessary; something he’s going to do on a weekly basis on his blog. Opinions may vary, but Christ’s message to the Church remains unchanged. The Book of Revelation is open to being read and understood. Christ will not speak to His church in mysterious images where only few could decipher. The original recipients never had the opportunity to read the manuscripts for themselves. It was read to their hearing (Rev 1: 3). I’m convinced that they understood it. Why not us? We have greater opportunities of library and internet accesses to resources today—more than ever. Let us exercise these opportunities to our advantage, and be compelled to an independent and in-depth study of the Book of Revelation, alongside with ardent prayer. Throughout this week, I will share snippets of thoughts from the Book of Revelation. I will also encourage you to follow Lange and Paulien to learn the methodologies in studying the Book. Let’s study together like the vultures gather around a carcass.